It was pitted as the inexperienced German “C” team vs. the veteran high-pressing juggernaut of Chile, and a match that was considered to showcase the two best teams in the 2017 FIFA Confederations Cup. As it happened, the match didn’t necessarily produce fireworks in terms of goals and it finished as a 1-1 draw, but it did deliver in terms of a tactical chess match. The cohesion and ferociousness of Chile’s high-press were evident, and so was Chile’s ability to attack in a number of phases, but the side that should come away with most to be happy about is undoubtedly Joachim Low’s German side. Per WhoScored.com, the defending World Cup Champions are currently boasting an average squad age of 23.7, and as a result of their young age, they should be proud of this result considering Chile are currently ranked 4th in FIFA’s June rankings. Prior to the start of the tournament, Low had received some criticism, especially from Russia’s World Cup organizing committee, but after a 3-2 win over Australia and coming back from a goal down against Chile, I’d say that Low is quite happy with his decision and Germany are on track for securing a strong squad for another six to eight years. Now, although Low’s men can be seen as taking the most out of the draw, Juan Antonio Pizzi’s Chile can leave with their heads held high and that they were well deserved of a point, too. They are coming off back to back Copa America wins and are looking to push themselves further come Russia 2018. Their high-pressing cohesion is at their peak it seems and their dynamism and pace in attacking phases is quite dangerous, especially in transition when defences aren’t at their most organised. Alexis Sanchez has now scored more goals for Chile (38) than any other player in the country’s history. After the break, Chile’s constant high-press was replaced by a mid-press/mid-block and I’d put my money on Pizzi wanting to keep his men fresh for the rest of the tournament. He likely opted to manage the final stretch of the match with a more pragmatic approach and minimize the chances of the Germans breaking their high-press with another out from the back leading goal. Now, here is where I think Chile have a problem. If you take away their high-press, you take away their best playmaker on the pitch. 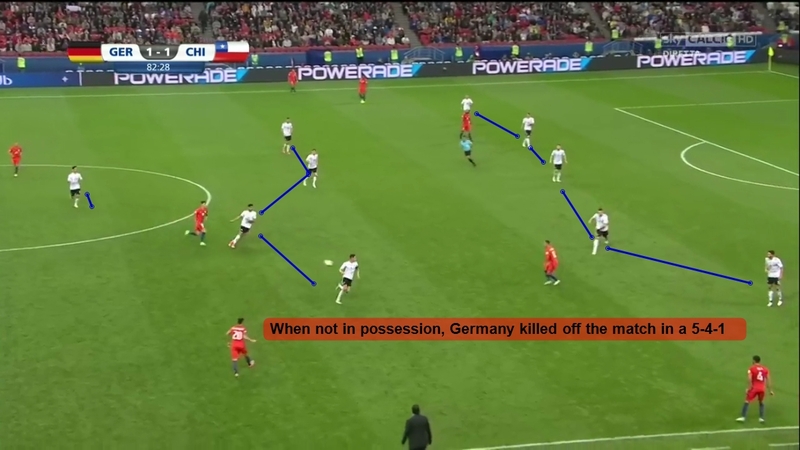 Chile’s possession game and ability to break a low-block isn’t at Argentina, Brazil, or Spain’s level due to talent inferiority and their tactical flexibility isn’t at Germany’s level. So, what can they do if their press fails or if they tire out? Just something to think about before Russia 2018. Anyway, read below for the tactics of a highly entertaining international affair. What a shocker, right? Well, we knew it was coming, but I don’t think we expected Germany to crumble as much as they did in the opening 20 or so minutes. The video below further illustrates how Chile’s high-press worked and the problems it caused Germany. Germany are a tactically flexible team. They can high-press, they have good positional awareness in possession, and their mid-block and low-blocks are quite effective at protecting their penalty area and winning the ball back in clever ways. In this match, they opted to high-press Chile at times where they felt the South Americans were vulnerable, but for the most part, they used a 5-3-2/5-4-1 mid-block. In particular, they liked to press Chile’s ball playing centre back with non-intense pressing but enough where they could implement a ‘pressing circle’ when Germany striker Lars Stindl could screen a horizontal pass to Chile’s Gary Medel. The video below shows one of the many ways Germany can win the ball back. However, on this occasion, they didn’t win it but forced Chile to go long. Germany kept their ball playing composure despite Chile’s consistent high-pressing and realized sooner or later there’d be a crack in the press. As it happened, Joshua Kimmich and Matthias Ginter were keys to Germany’s build-up from the back. Watch below. After the break, the match was tied at 1-1 and Chile came out with a 2-1-2 mid-press. Vidal dropped deeper to offer more central axis cover and Chile conserved their energy and invited Germany to possess the ball more in order to counter. Germany, on the other hand, opted to use a 5-4-1 low-block to kill off the match when they weren’t in possession. The 1-1 draw keeps both sides in the fight to advance to the semis with Cameroon and Australia both inferior in terms of talent and boasting only one point apiece in the group.